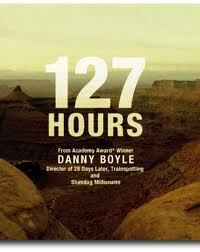 I think Danny Boyle decided to work on 127 Hours as a way to help people cope with Wednesdays. I'm sure Aron Ralston's book is very inspiring as well, and it probably had a little something to do with it, but I've got to say, if you think you're having a tough week, watching a guy drink his own urine and cut his own arm off has a way of putting things in perspective. Speaking of perspective, I'm trying to find some as I stare down the home stretch of what I hope will be the final draft of my current novel. (Of course, if someone buys it from me, I'm happy to make revisions they request, but this is the last time I want to do it gratis.) As the ladies in my online critique group know, I considered writing a short story and exploring ways to sell a short story as a way to grab the attention of prospective agents. That's a desperate move for me. Short stories are not my thing. About once a year, I'll think it's a good idea to write a short story. Then, I realize that all of my short story ideas are half-baked novels. Maybe I'll "break the code" some day, but today is not that day.